Defense rolls the ball out to the offense on the wing. The offensive player can't move until the ball crosses the 3-point line, and the defender can't cross the 3-point line. It's up to the defender to roll the ball slowly enough that he/she can close out quickly enough, yet fast enough that the close out is realistic for a game situation. Defense closes out under control and gets "ten toes to the sideline", forcing the offensive player to drive towards the baseline. For the 1st part of the drill, the offensive player gets 2 dribbles to try to score a lay-up of a short jumper. He/she should try to drive to the middle as much as possible, but it is okay to drive toward the baseline if the defender overplays too much. The defender must stop the drive to the middle and must box-out if a shot goes up. 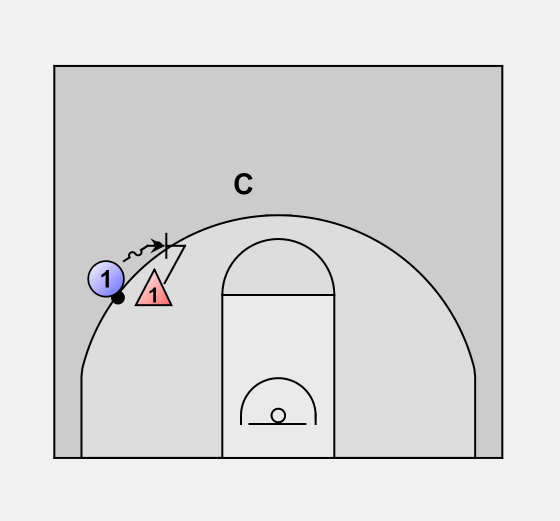 For part 2, the offensive player only drives if the defender's close out is terrible (i.e. too slow, too close, leaves middle open, etc.). Otherwise, he/she passes to the coach for a give and go. The defender must "jump to the pass" to get in the "deny" position and prevent a give and go. If the offensive player gets over the top for a give and go, the coach makes the pass. The defender may try to get back in front of them or back tip the ball, but he/she has already failed if the give and go is made. If the defense cuts off the give-n-go, the offensive player cuts backdoor. It's important that the defense stays "belly to belly" with the offense while keeping hands up and turning his/her head to see the ball. The defender may keep an arm against the offense as he/she cuts. The coach attempts to pass to the offensive player and the defender must either steal or knock away the pass. For part 3, the coach only makes the pass to the backdoor cutter if the defender isn't working hard. 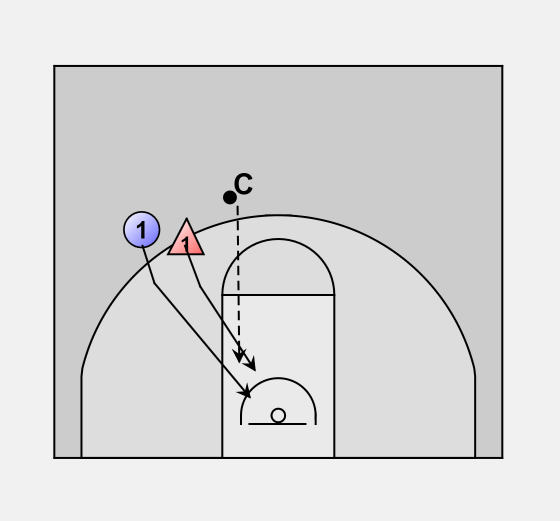 The offense runs all the way to the opposite corner from the backdoor cut. The defense must stay "head in the bucket" and protect the basket while the ball is two passes away. If the defense leaves the middle open, the coach can drive to the basket. If the defender stays where he/she is supposed to, the coach takes a dribble across the top to swing the ball to the offense. As the ball crosses the middle of the court, the defender moves to the "open" position, helping defend the post while still being able to guard the offensive player in the corner. As the coach continues to dribble across, the defender must close out to the "deny" position, or "up the line". 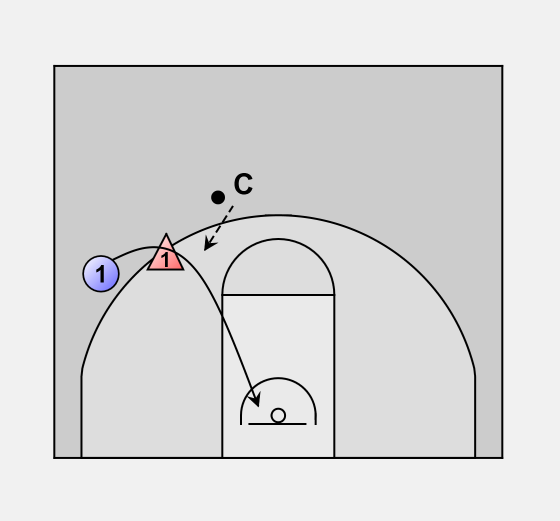 The defender must not close out straight at the offensive player, or they will have no chance to recover if the offensive player cuts backdoor. The coach passes to the offensive player. The defender tries to knock it away or steal it, but must not gamble and get beat. If the pass makes it through, the offensive player can either shoot or drive to the basket. If it's a shot, the defender must call "shot!" and box-out and get the rebound. If it's a drive, the defender must force him/her towards the baseline and cut them off at the short corner. 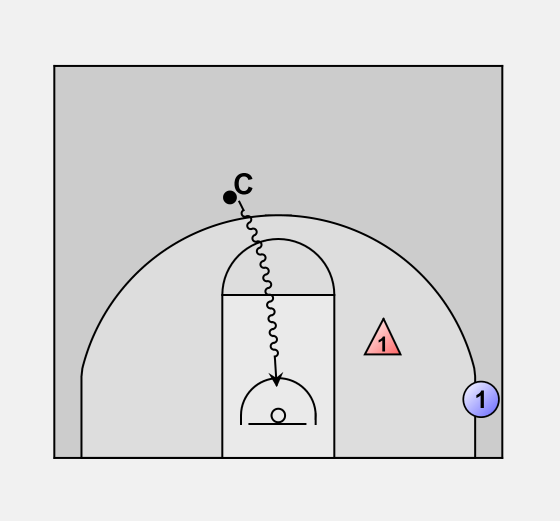 For the 4th part, instead of dribbling across the top of the key, the coach will dribble away towards the opposite wing. The offensive player will flash to the middle, trying to get to the ball-side elbow. The defender must "bump the cutter" and make sure that neither the offensive player gets past him/her nor a pass is made to the flashing offensive player. If the pass gets to the offensive player, he/she has two dribbles to score, although the defender has already failed. If the defender successfully stops the flash, the coach shoots and the defender must box-out the offensive player and get the rebound.